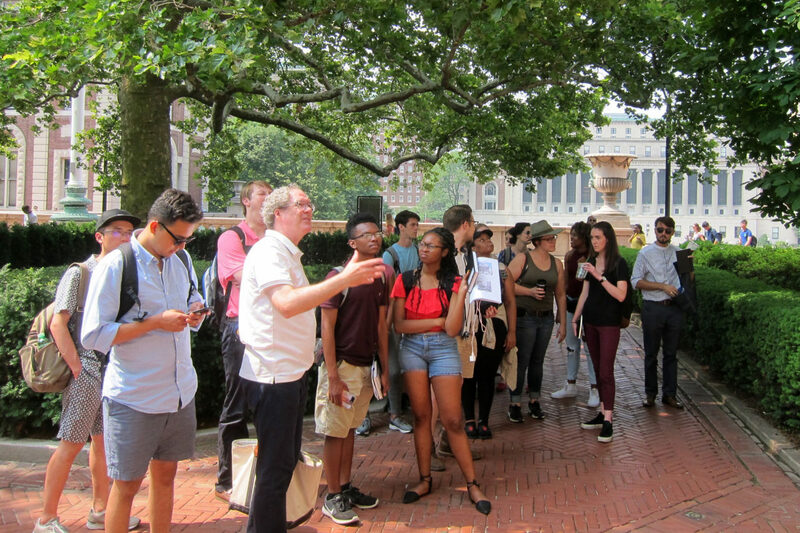 Follow the ICAA’s 2018 Summer Studio in Classical Architecture program, from June 18th through July 14th, as students from across the country spend four weeks in New York City and the surrounding region exploring the ideas, methods, and issues related to classical architectural design. 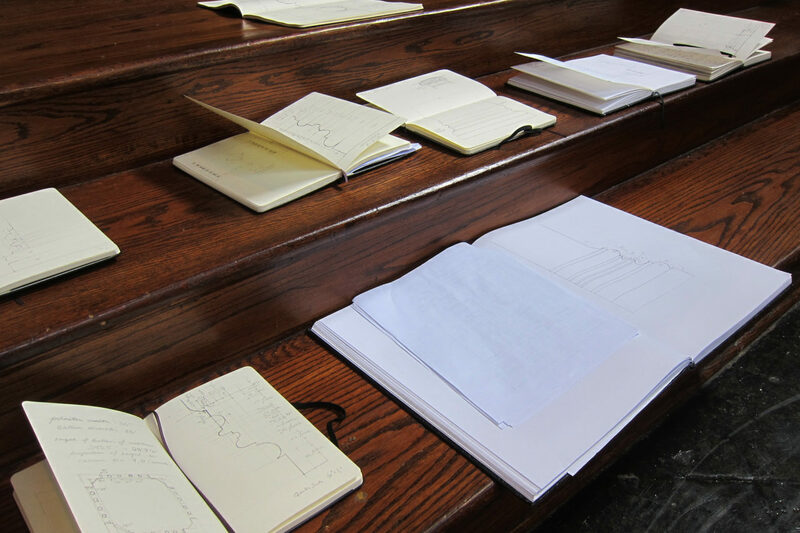 You can also read updates from weeks one, two, and four. 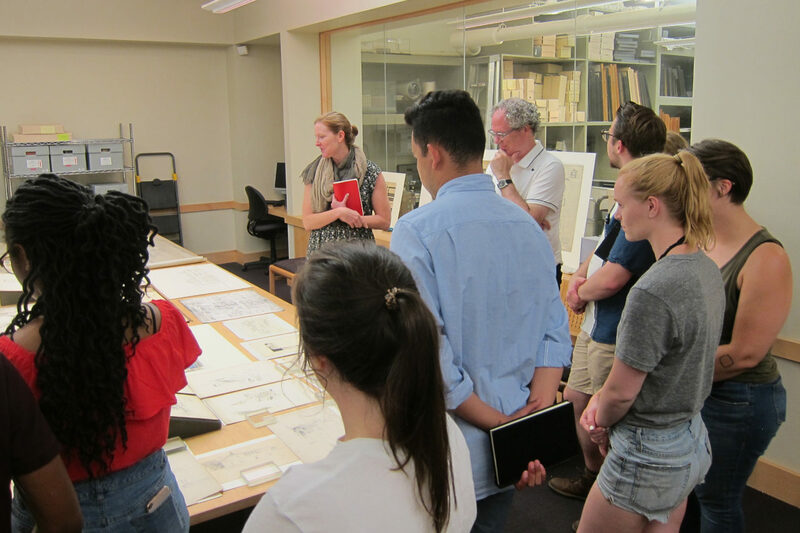 Summer Studio in Classical Architecture student Jheanelle Miller gives an update on the third week of the 2018 program, which included an introduction to ink wash rendering, a visit to the offices of Robert A. M. Stern Architects, and a tour of Yale University. 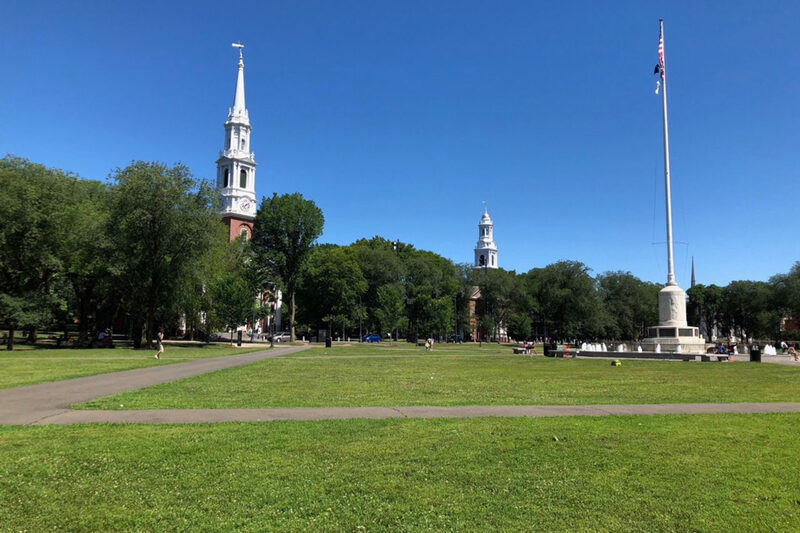 Today we took a train to New Haven, Connecticut, where we met with George Knight in the New Haven Green. 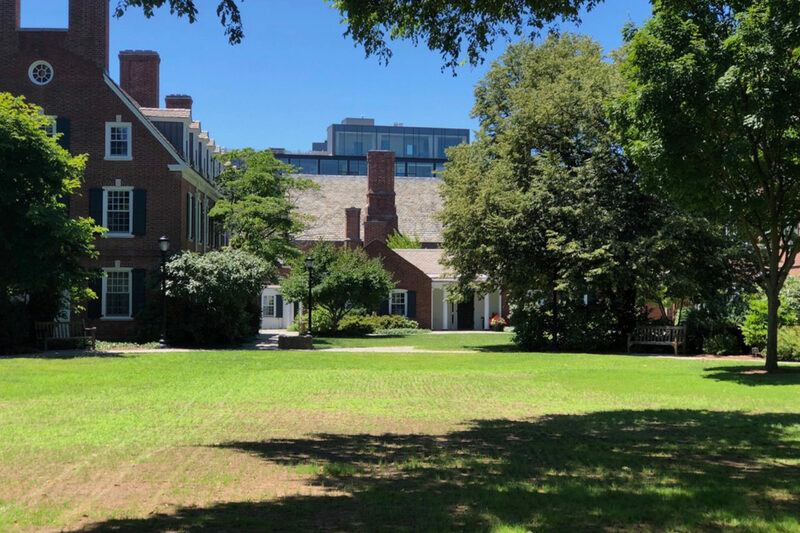 He gave us a little history about the area, from the Quinnipiac people, the first to settle in the area, to the Puritans, who planned the city based on theocratic principals. 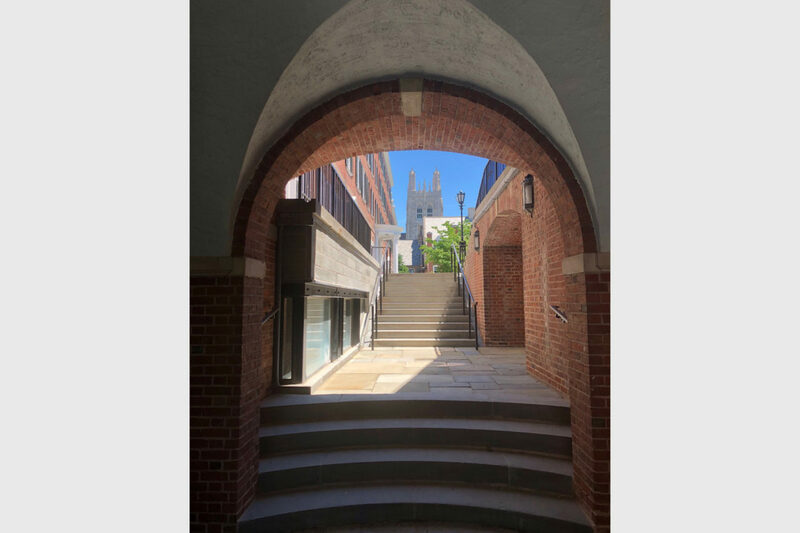 We then journeyed from the New Haven Green to the Yale University campus, where we walked through a few of the residential spaces and discussed the courtyard conditions of each space. 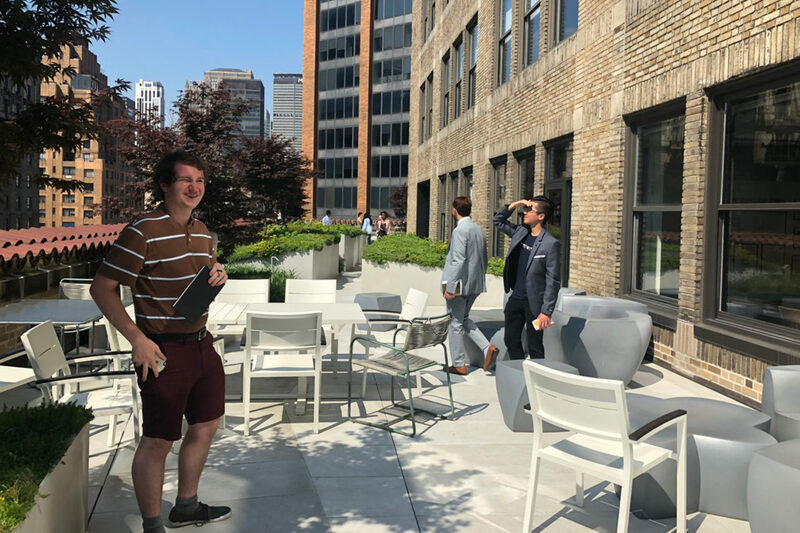 George explained that there are typically shorter buildings on the south side of a courtyard in order to allow light into the space. 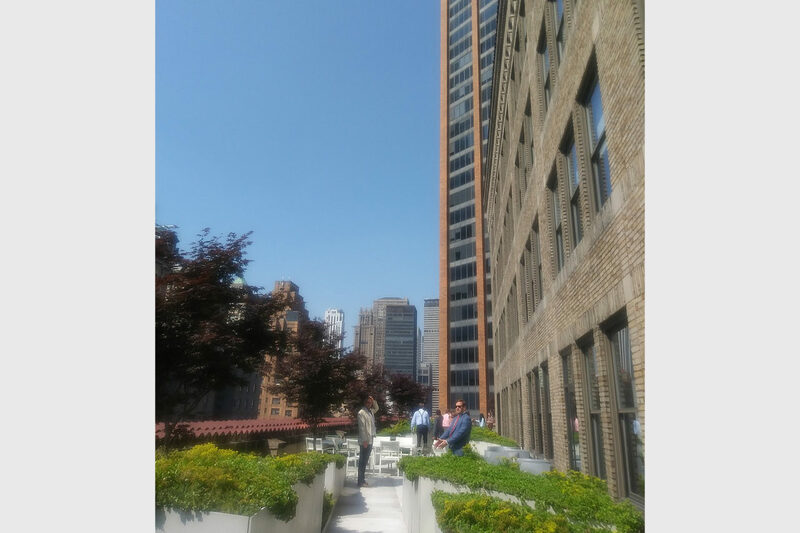 On the street side of a courtyard, taller buildings will typically be found. 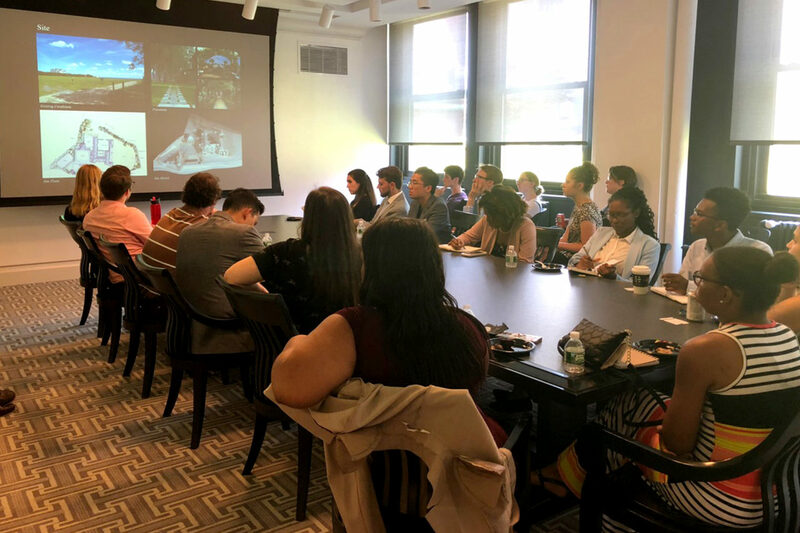 He explained that this is particularly important for separating the public streets from the private residential spaces. 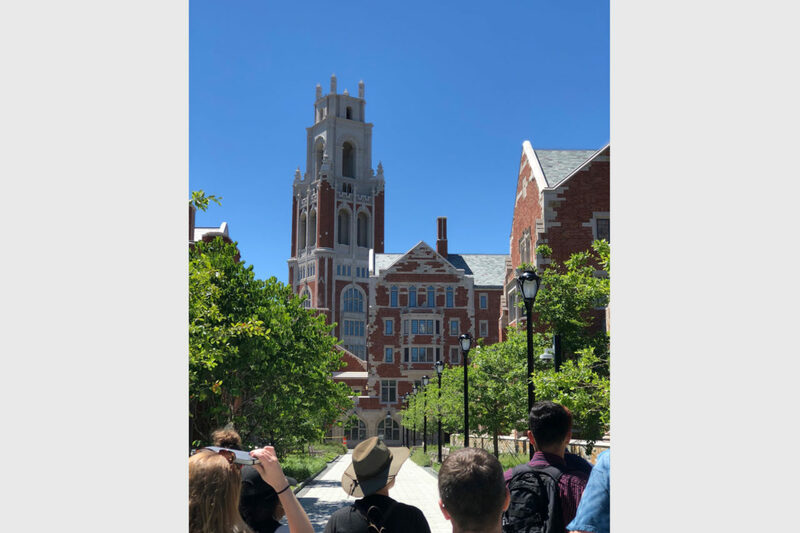 After touring some of the residential areas, we were able to look at some of the recently constructed buildings on the Yale campus. 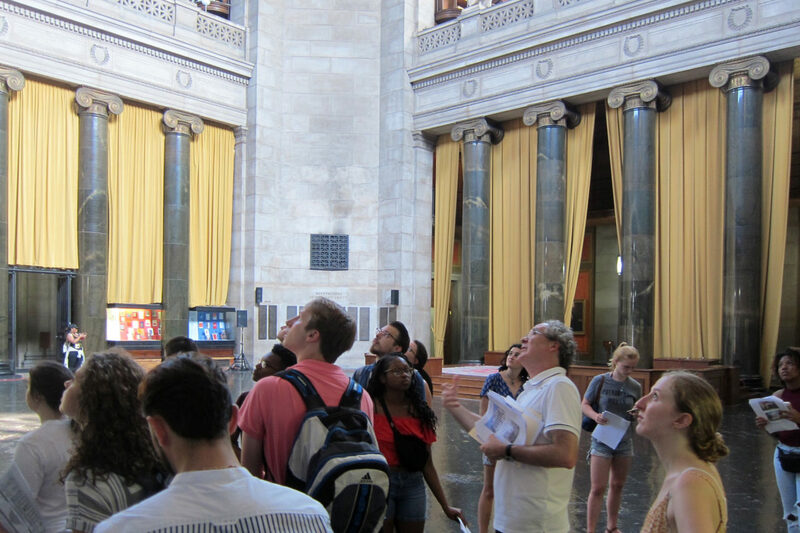 Overall, it was an incredible experience to physically walk and experience how classical architecture can carry through from older buildings to more modern buildings. 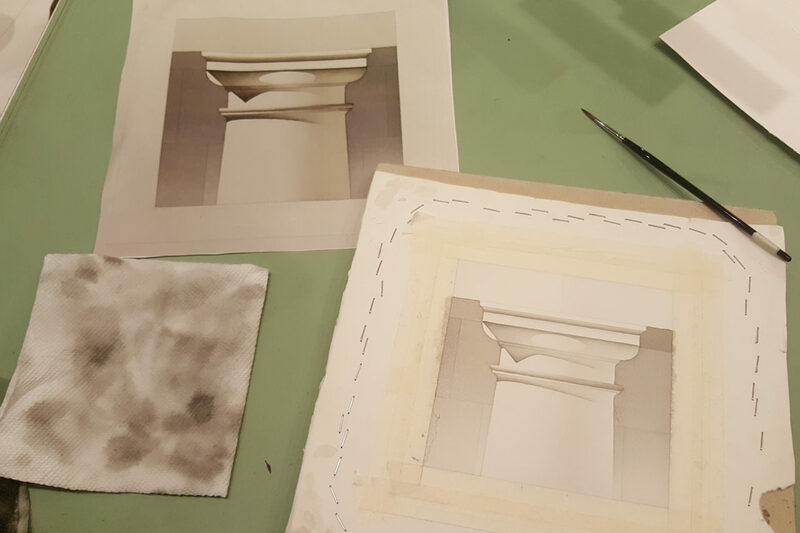 Today we were lucky enough to spend the whole day focusing on a single exercise - a light and shadow study of a Doric capital rendered in ink wash, which was a challenging and thrilling process. 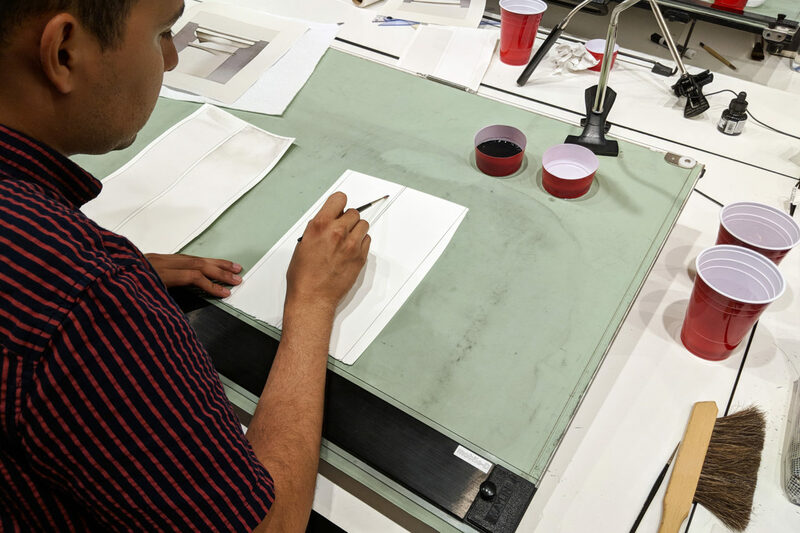 Over the course of the day we built up layer upon layer of diluted black ink using several techniques, including flat wash and gradient wash.
Our instructor, David Genther, demonstrated each step to the class before we tried it on our own. He stressed the difference between painting "up to the line" and having a wider gaze, focusing on the strategy of creating an illusion of dimension. His individual guidance, along with that of our teaching assistants Patrick Vercio and Danielle Murphy, led to excellent results. This morning we continued to refine our final projects during studio time. 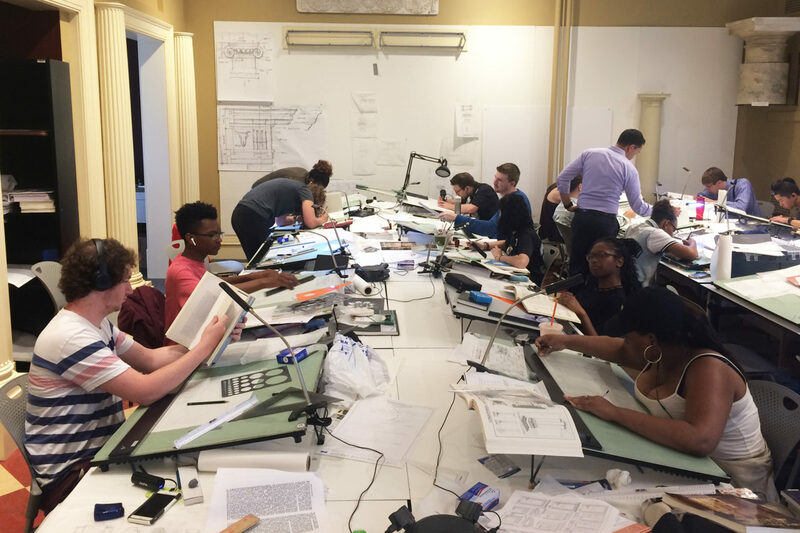 It’s been wonderful and informative to work on our own design projects because when we run into problems we have to solve them by looking toward precedent, books, or our instructors. 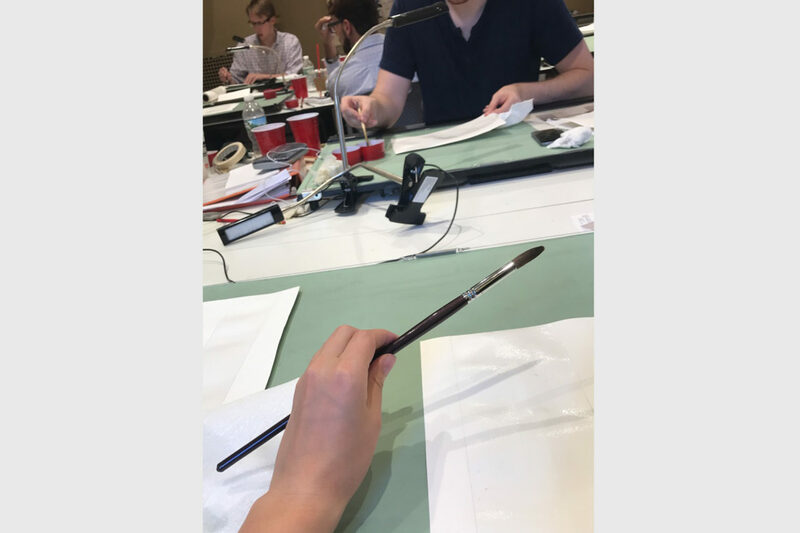 While it can be slow moving, because for many of us it is our first time drafting using the classical tradition, the information and skills really stick with us because we’re having to apply them. 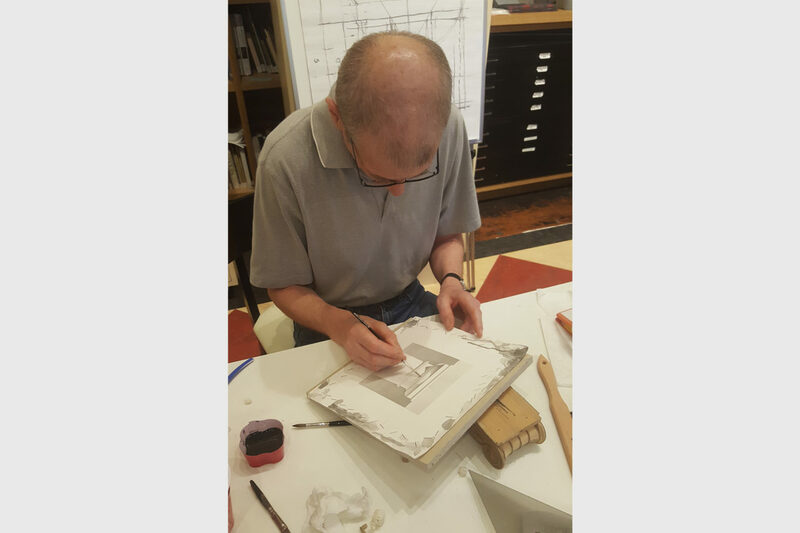 For our afternoon class we began our lessons in ink wash rendering with instructor David Genther. 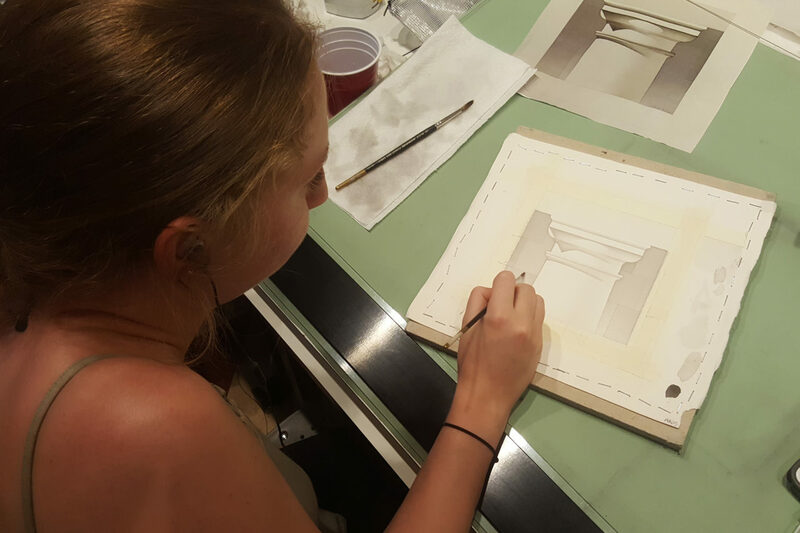 We practiced basic skills, like flat washing and gradients, to prepare us for tomorrow’s full rendering of a column capital. Washing is all about layering, patience, and understanding light and shade. 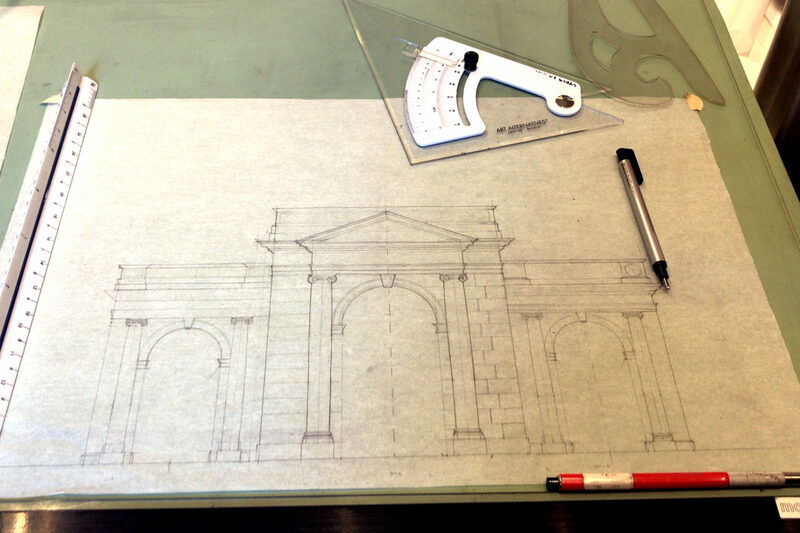 The exercise of washing, besides being a beautiful way to finish drawings, also teaches us to be more aware of how light and shade interact with architectural structures and how this affects the overall appearance of buildings we see and design. 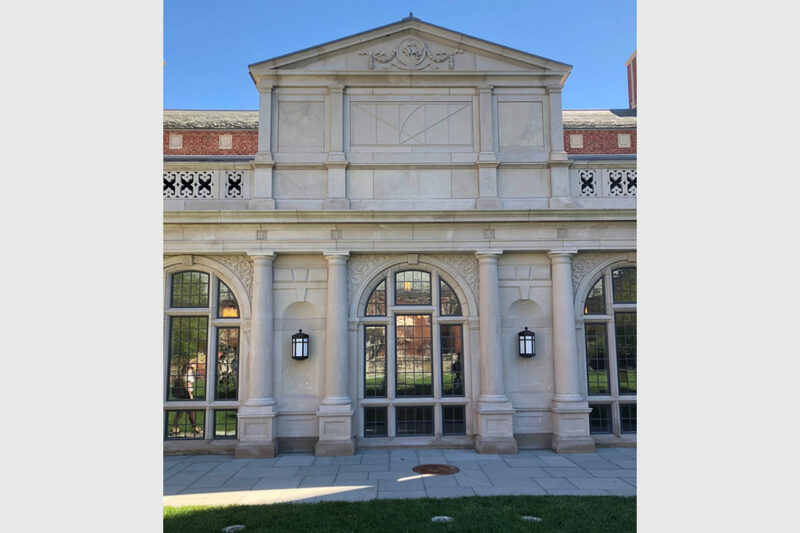 It has been interesting to connect the dots and see how each new skill we learn helps us improve other skills, each one building on the other. 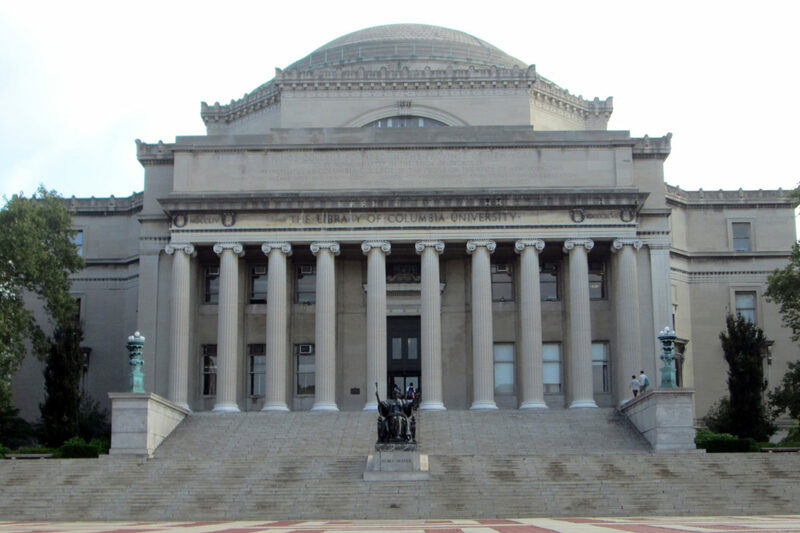 We began today at the renowned McKim, Mead & White designed campus of Columbia University. 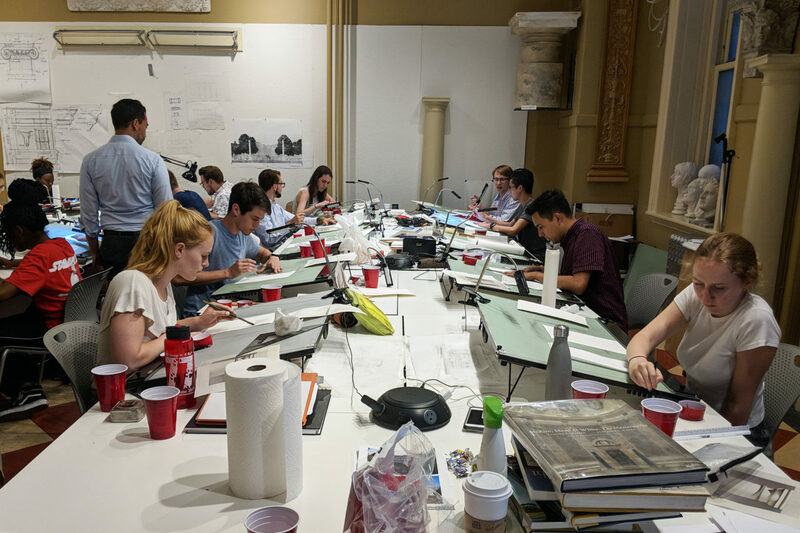 Guided by Stephen Chrisman of Ferguson & Shamamian Architects and teaching assistant Aaron Helfand, we studied and completed detailed measured drawings of the column bases found in the interior of Low Memorial Library. 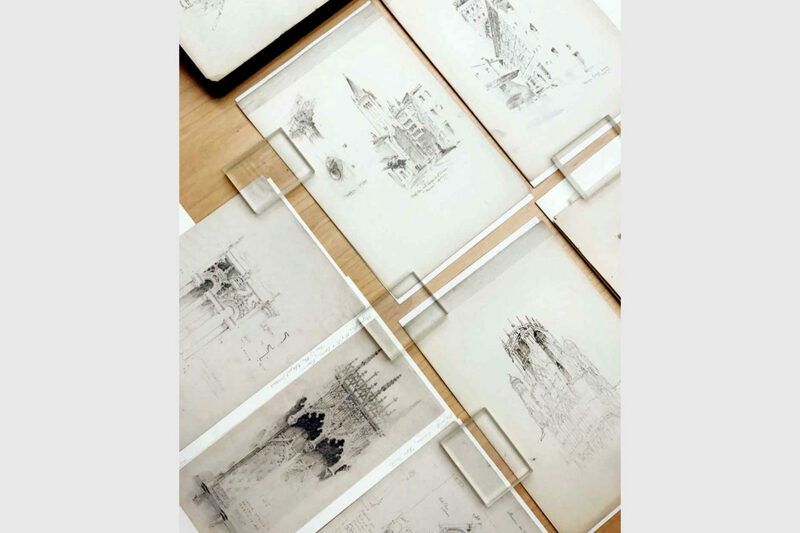 We also had the privilege of visiting the Avery Drawings & Archives Collection which houses many original architectural drawings. 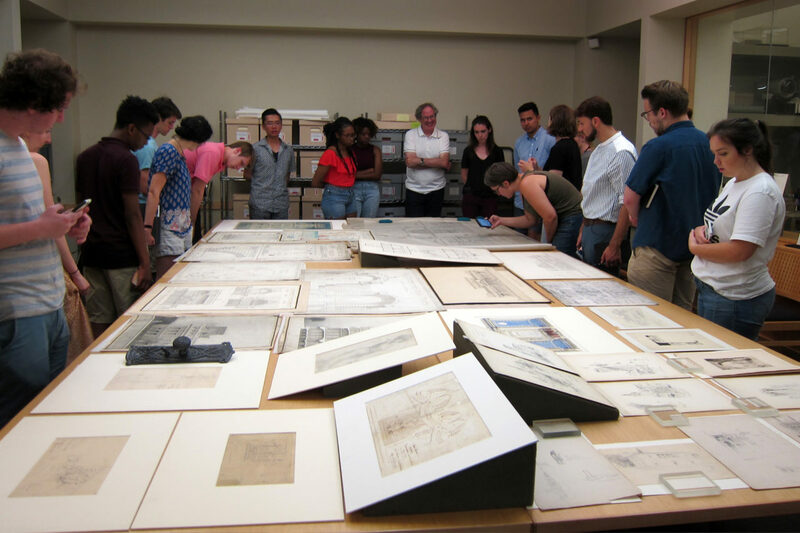 The drawings we saw were incredibly beautiful, and having the opportunity to admire and learn from the work of past architects was a valuable experience. Afterwards we headed back to the studio to further develop the major projects that we have been working on. 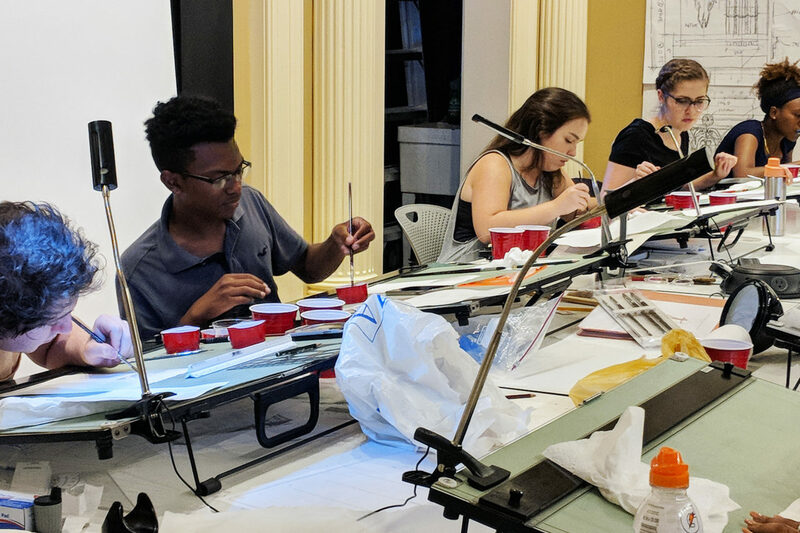 Instructor Michael Mesko and teaching assistant Lora Shea gave us all individual critiques and helped us work through some of the design problems we have encountered. We began today in the studio, learning about the elements of the Corinthian order. After that session, we had the rest of the morning to work on our design development for our final project. 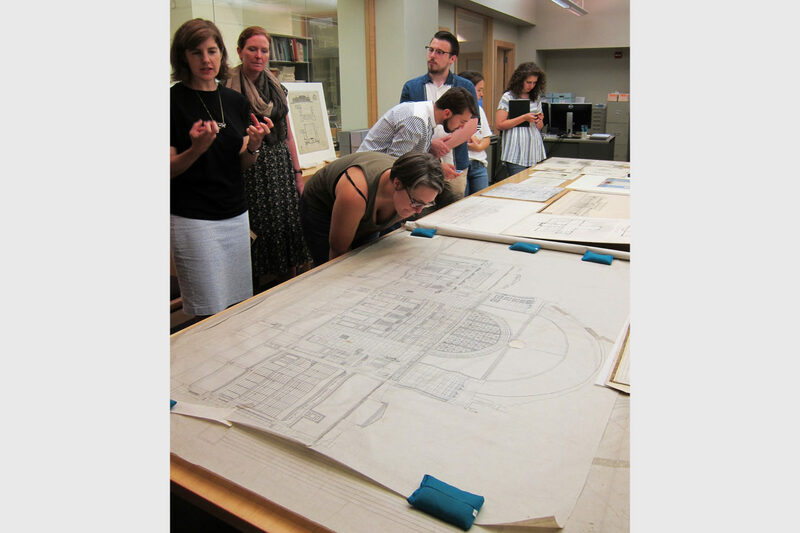 We then went on a field trip to visit to the offices of Robert A. M. Stern Architects. 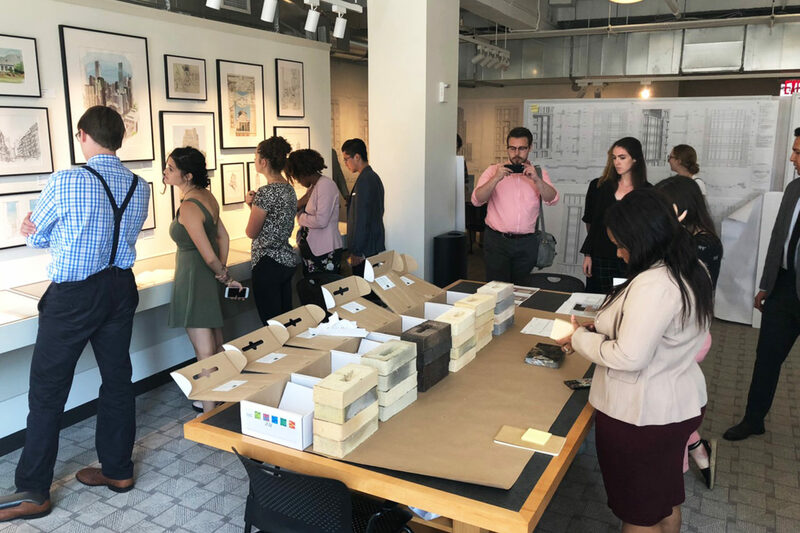 During the tour we had the privilege of seeing some of the current projects being worked on by the firm. The office visit was very informative and insightful. 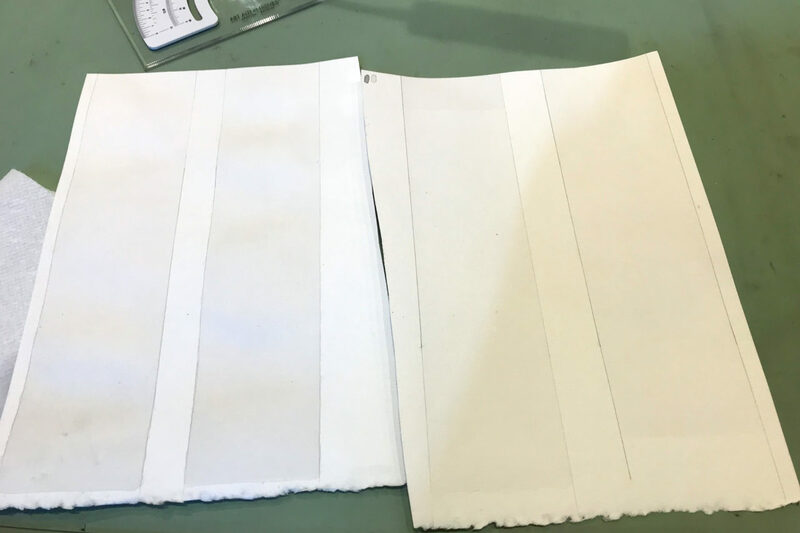 After lunch, we returned to the studio to continue working on the designs for our final project.